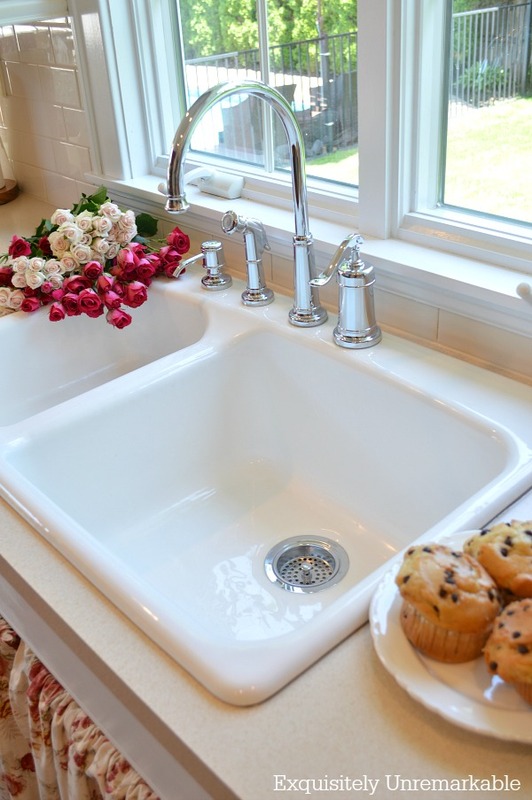 Big, white, workhorse style porcelain sinks have always been my favorites. They remind of old farmhouses, my grandmother's comfortable kitchen and the kind of character filled homes I have always loved. 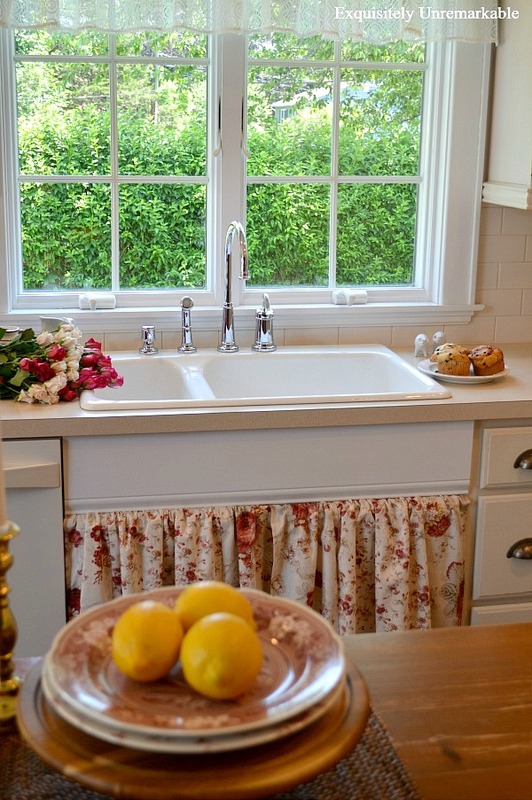 When we added our kitchen, about fifteen years ago, apron front/ farmhouse style sinks were just starting to show up in main stream magazines and I was smitten. While I had no plan regarding cabinets, appliances or flooring, I was certain that I would have one of those dreamy throwbacks like grandma had. I mean, how hard could it be, it was just a sink. Of course, by now you probably know how that story ended, but when I finally gave up on the apron and decided to go with a plain white porcelain drop in model straight off the shelf at Home Depot, the criticism was just as harsh. Oh no. That's what my mom had. You should get stainless. It's very in now. Ma'am you understand that porcelain isn't really in style and it doesn't wear well. It's going to chip and stain and pit and look terrible very fast. Bad choice. Clearly, I'm not one to follow the crowd, or listen to advice, because I went out and picked one that was as close to my farmhouse dream as I could get. And I was actually very happy with it. 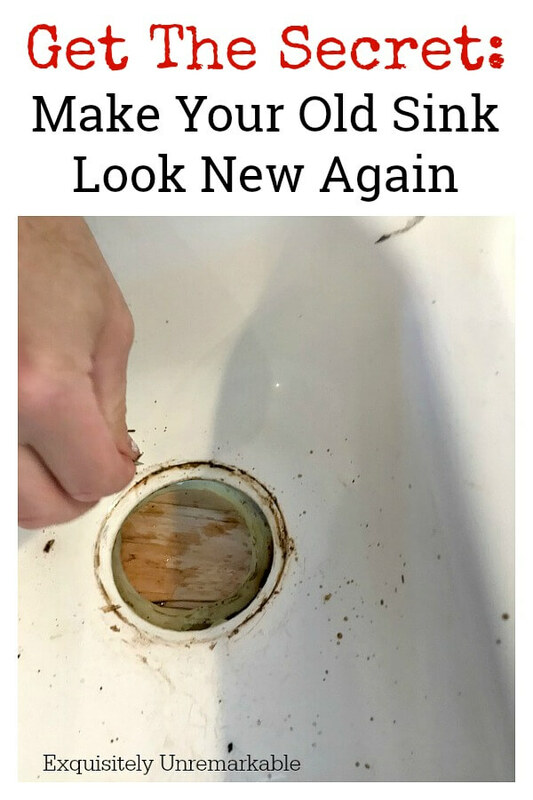 Yes, I thought that eventually I would replace it with a real farmhouse sink but for the time being it would do and it held up well. It stood up to my family and everything we threw at it. We tossed pots and pans around, we've broken glasses and plates in it, I've cut flowers, planted things, washed out paint brushes and play doh and concoctions of all kinds and colors. It wasn't perfect of course, it was a little scuffed and marred, but nothing we couldn't live with. It turned out to be a excellent investment and there was really no reason to replace it...well, no good reason...except for that incessant desire. 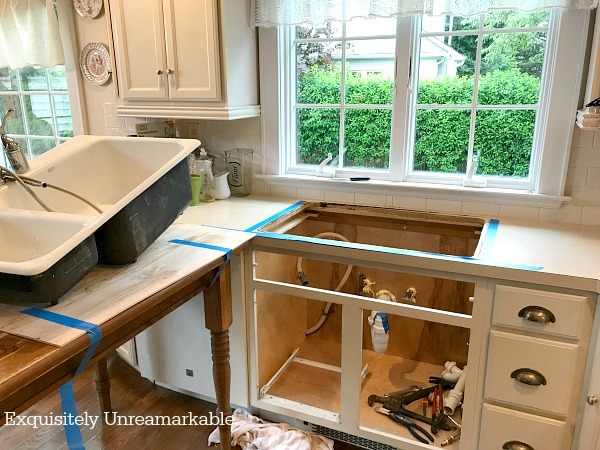 That silly apron front sink. It was a like a disease. I had to have it. My chance to score one popped up when it recently became necessary to replace the faucet. My husband said, now or never. I'm not climbing under there twice. That's all I needed to hear. However, after two weeks spent on Google, at Home Depot, Lowe's and the local kitchen shop it became very evident that drop-in models were no longer available. If I wanted that sink I was going to have to pay up...big...and replace my countertops. Um..no. There was nothing wrong with them, plus I still loved them. What was I going to replace them with that would make my kitchen any better? Nothing. But this was not in the plan. Fifteen years I had waited for that elusive sink and now so close, with a willing coconspirator, I had hit a dead end. I have to say what followed was basically a temper tantrum, of which I am not proud. Like a spoiled toddler, or teenager, I dug in my heels and said well if I can't get the sink I always wanted, I'm at least getting a brand new one. 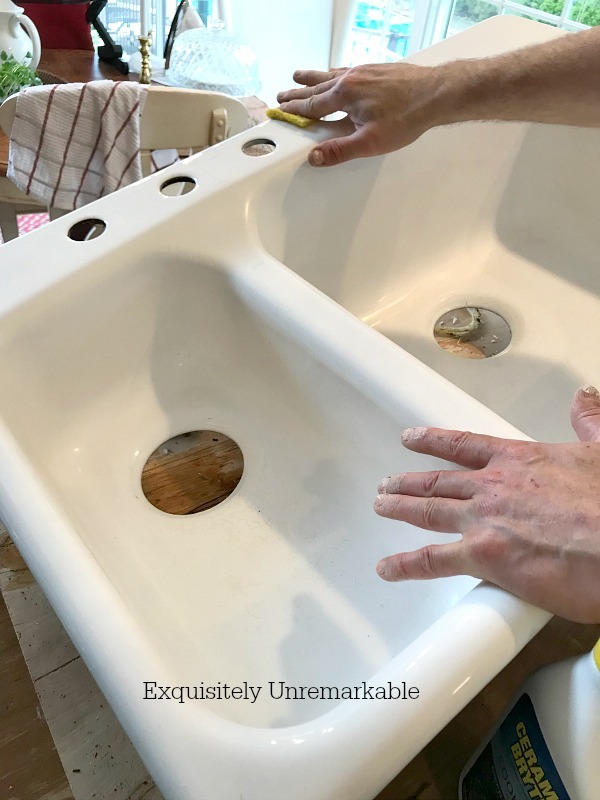 My ever-patient husband knew better than to argue with me at this point and just said, ok. That night I ordered a huge white porcelain basin sink, very reminiscent of the farmhouse style, I put in in my cart and clicked pay. That is when the real fun began. When we went to pick it up at the Home Depot several towns away, it was chipped. Okay...They had to track down another one, find a guy with a machine to get it down from the shelf and while that guy was contemplating how he was going to get it into the cart, my husband picked it up and plopped it in himself. It was very, very heavy, but he lifted again to get in the Jeep. Once home, he unloaded that sucker from the car, brought it in the house and proceeded to disconnect and remove the old one. That one was just as heavy. After about an hour of backbreaking work, he was ready to install the new one. Not quite the dream sink, but a worthy consolation prize that was going to make it all better. The lollipop for this spoiled, design obsessed brat. It was a big moment. 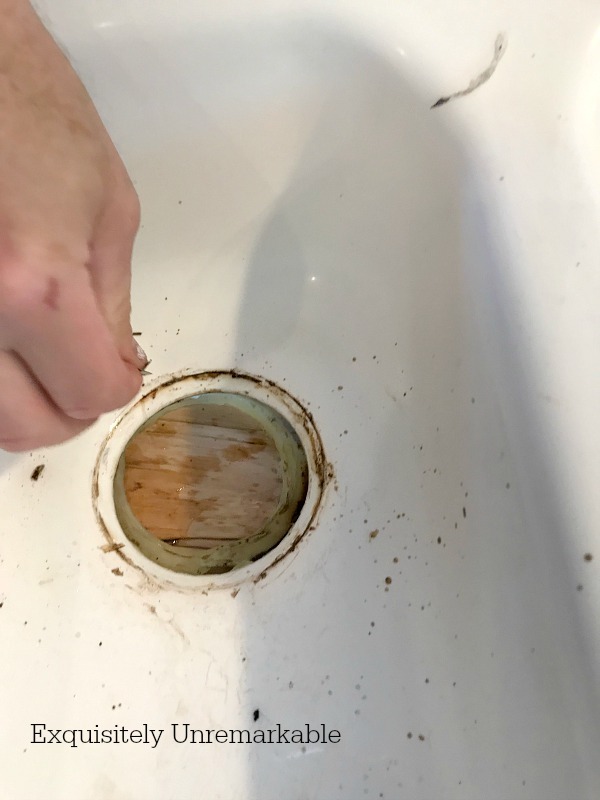 Until we realized that even though the measurements were the same as the old sink and it should've just dropped in the existing hole, it didn't fit. The sides were tapered. Our hole was for a square. Nowhere on the box or in the description did it say this. Of course, had I read the first review, I would've known this. The complaints were right there in black and white. Don't be fooled this will not fit. I always read reviews. I want to make sure I am ordering the right thing, that I am getting the full picture. Apparently, in my tantrum fueled haste, I skipped that step. Oops. Now what? My poor husband just looked at me and laughed. He stood there pondering ways we might make it work aloud, while I was silent (a rarity), ready to cry. Not only did I feel bad that this guy had lifted and lifted and lifted again for absolutely nothing, I was so sad and mad that I wasn't getting my new sink after all. A sink that I had wanted from the get go, fifteen years ago. A sink I never stopped wanting...and clearly a sink I was never going to get. Now, before you jump in and say, hey lady, it's just a sink, get over it, I know this and ordinarily, I'd be the one saying it. I write about design with an air of great importance and weight. But if you know me at all, it's done with humor and sarcasm, in a tongue in cheek kind of way. It's only decor. I am very well aware. There are so many, many things that are more important than a torn couch, or whether your furniture is all on or off your rug or what color grey you painted your master. It's the exact reason I write about crafts and DIY and the color of your tissue boxes, because it's all pretty inconsequential. Mistakes can be fixed, paint can be covered up and tears can be stitched. There are no life and death decorating decisions. It's supposed to be joyful...even if it's frustrating at times. But that stupid sink had been my nemesis for so long it just took me down that day. I don't know, maybe I was missing my mother more than usual, perhaps it was a stand in for the disappointment I've felt about her situation at the end, that I could never make it quite right. Maybe it's that I just turned 50 and I suddenly feel very old or peri-menopause and the insomnia. Or not, I don't know. What I do know is that when my sweet, tired husband stopped laughing he said, Ok, so let's rip out the countertops and do it right. It was better than a proposal. And in that moment, I was back. Me. The "who cares what kind of sink I have" girl. I told him our old sink was perfect. I had everything I needed already. I was good. So we packed and he lifted and that rounded mess went back to the store...several towns away and we spent the rest of the afternoon cleaning the original sink up with Cerama Bryte, the miracle cleaner I keep telling you about. It literally took every stain, smudge, black scuff mark and dull spot out. When we were finished, and it was back in place that sucker looked brand spanking new. It was so shiny, I was shocked. Dressed up with a new faucet and a custom skirt that sink took center stage. Cottage style with an old farmhouse flair. Fifteen years I waited for a sink that I already had. I wonder what my grandmother would say about that. Oh I so love this post. Reminds me so many times of my own trials and concerns. I agree, your sink is perfect. Your hubby is one patient man and so is mine. We are blessed. 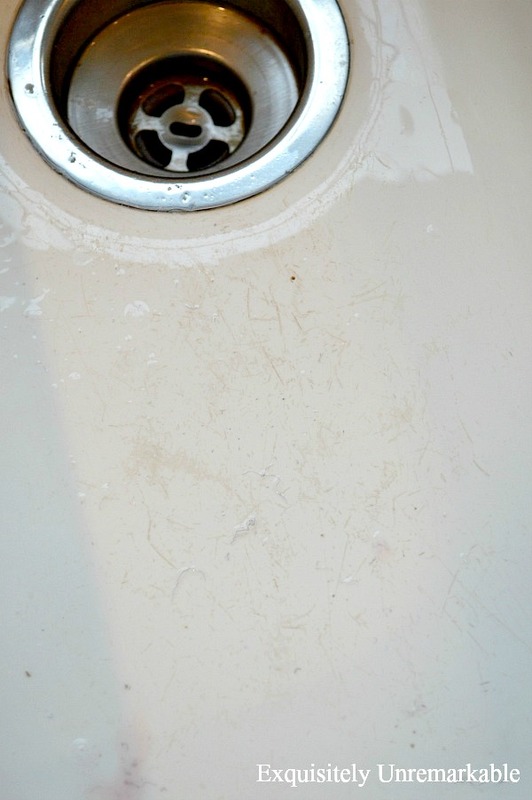 I love my white porcelain sink - for me it's a keeper and I will have to try the cleaner. Great post. Thanks so much...and I couldn't believe what a difference the cleaner made. I'm shining once a week now! Thanks so much for the visit and comment today. My friends always tell me....you are so lucky to have a husband like Drew, he knows and does so much. And I always respond, well he's a pretty lucky guy too. ;) But I have to say, your husband rocks. He gets a gold star in my book. You both make a great pair. Kim, I can relate--the struggle is real! As bloggers we decorate, we style, arrange and rearrange and then take a million photos to get just the "right one" and occasionally get those notions about that perfect thing that will complete "the look." I've been there, too and I love your sink story ;) p.s. I also love how your husband responded--smart man! Totally, Cecelia...living in the land of perfect decor blogs can skew reality sometimes. It was good to step away from the computer and snap back into real life and what truly matters. It is funny! I grew up in house that was always decorated on the cutting edge and I loved it. We used to go to my aunt's New England home, in the country (to us anyway!) and I would see wooden rocking chairs and braided rugs and cringe. Of course, now, that is what I am drawn to...it just feels warm and cozy. I think my aunt would be happy about that! And I'm glad you got a laugh out of this one. That's always the hope!! Thanks so much, Nancy. I really don't know why that sink had such a hold on me. I mean after all, it's just a sink. When the water hoses broke and we had to put a terribly mismatched, junk parts fixture there while waiting for the new one, I didn't care what it looked like. I was so grateful to have water!! And I think about you often in your digs and your new state. I know it must be a wonderful adventure, but even happy adventures are not without adjustment. I'm sure it's not easy. Hugs!! Oh, and when i bought this old house, I gad an option on an old porcelain sink. Wish i would have bought it! Your husband is an angel. I understand your meltdown and frustration. I repeat, your husband is an angel! I totally get it, Nancy. There are certain things that are nonnegotiable. I really do hope that your love seat fix makes it more comfortable for you. You're super crafty, so I know you will make it work. And yes, he's an angel and I tell him so often. Probably not often enough, but often! Oh how I love this post! Your sink looks gorgeous and what I like is that it does not look like everyone else's sink!!! Your husband is a real sweetheart, for sure! I love your kitchen. So fresh and happy. I have a white porcelain sink too Chose it when we replaced the ugly stainless one when we moved here). I love my sink, well, pretty much. It is chipped and stained and scratched. That part I don't like, but I STILL like it better than the stainless. Now that I have read about your miracle cleaner I am hoping to love it again. Thanks for the advice. My kitchen is a far cry from yours but it makes me pretty happy. Judy, I have been there with the paint, too. We certainly have sainted husbands, don't we? And my neighborhood is full of stainless sinks. They're practical, they hold up well and I think they're very in style...and if you enjoy it, that's all that matters! Oh I so loved this! We waste a lot of time wanting something only to find out we already have it. Just like everyone else, I loved this Kim! Especially your honesty, and THE TANTRUM! I've had so many of those that I'm not proud of either. Bless your dear hubby for laughing. He knows just how to handle his Kim! Bless you for taking that sink back & being happy with it & all it took was a cleaner! I am so glad to hear that I am not the only one who has an occasional tantrum over silly things, Florence. And yes, laughing was awesome. Straightened me and my bad attitude right out!! Happy how the story ended . . .
And look at the money that was saved . . . I agree with a comment above . . . your husband rocks . . .
and spruce up my stainless sink and ceramic stove top . . . pronto! Great read . . . excellent writer . . .
Love it!! Looks shining and beautiful! Thanks Angela! It is still very shiny!! I love this story, Kim! Thanks Deanna. While it was a mess then, my husband and I laugh about that day now. And we love the sink. Thanks for the tip on the cleaner! I LOVE my white porcelain sink but it's needs some love so I will be trying the Cerama Bryte. Glad the sink dilemma worked out in the end. Thanks AnnMarie! I'm glad it worked out, too...and the fact that it's clean and shiny now is a bonus. Hope it works for you, too. Kind of like in The Wizard of OZ, when Dorothy realizes there is no place like home :-). Great story!! Hi Kim, oh I love this sink story. I will have to say that you have a patient and good husband. You two work so well together on your house projects. 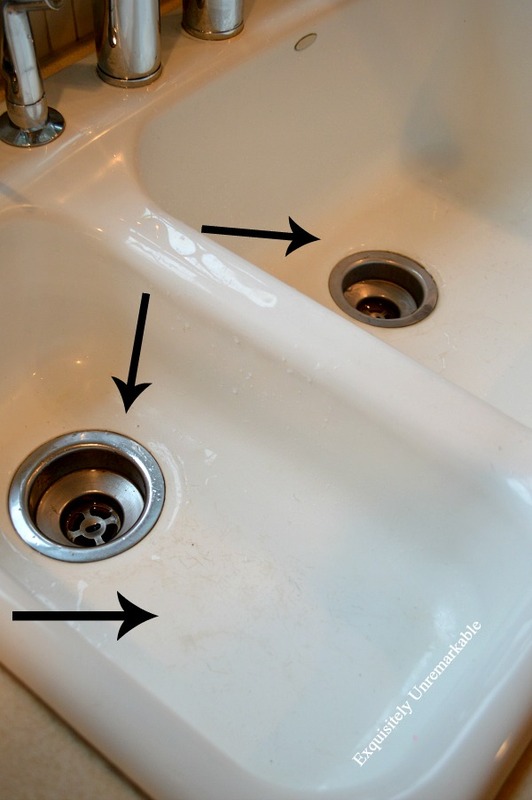 I love the way that cleaner works and the sink looks great. 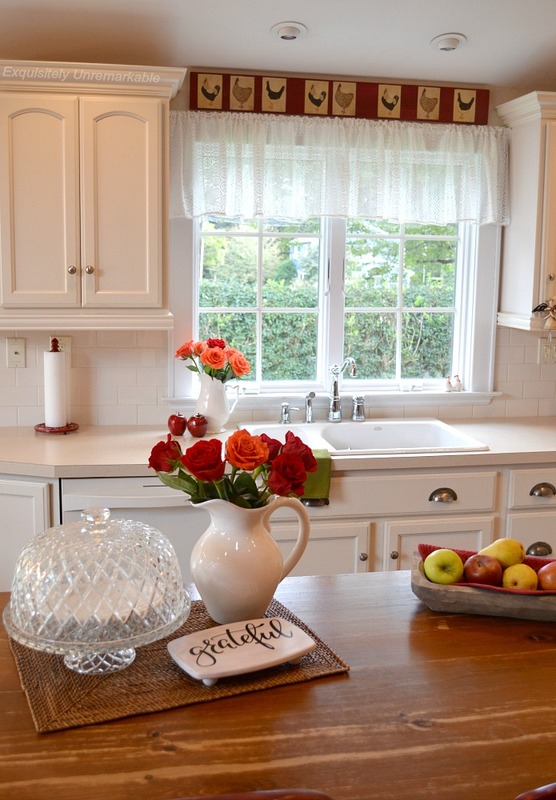 The curtain on the front cabinets make it look real farm house and I just love that pretty fabric. Thanks Julie! He's a good guy and enjoys the DIY stuff as much as I do, so it works out well. I never thought I'd say this about a sink post but that was very satisfying. I'm glad you kept the old one and found a way to own it like never before. When we bought our Ikea kitchen for the Greece apartment we also had a huge problem with the sink. It would fit in but not quite and we had to cut and cut and in the end the underside of the counter looked like a jigsaw puzzle. I don't wish that on anybody. And your husband rocks!! Thank you for sharing. I do like the inspiration you share with us, the projects are projects that make sense, and are something most of us can manage with a wee bit of help. I really appreciate that you look at the cost regarding the projects, using what we already have to make something look new. Well done, as always. Thanks Kristi. We love it! Loved your story!!! You are the BEST! I have a 68 year old white porcelain sink...it has two bowls and is very deep! I would strangle anyone who tried to change it!! Kim, what a great story with a happy ending. You make a great team and he is there for you, which is better than a farm sink. Several years ago I saw a sign I refused to pay $15 for but it had a great impact. "Someone else would be happy to have what you have" So many don't have husbands or the old home anymore, but we count our blessings. You are such a blessing to us. If it makes you feel any better, Kim, I have had silly adult temper tantrums like that, too. Our husbands are very patient men. 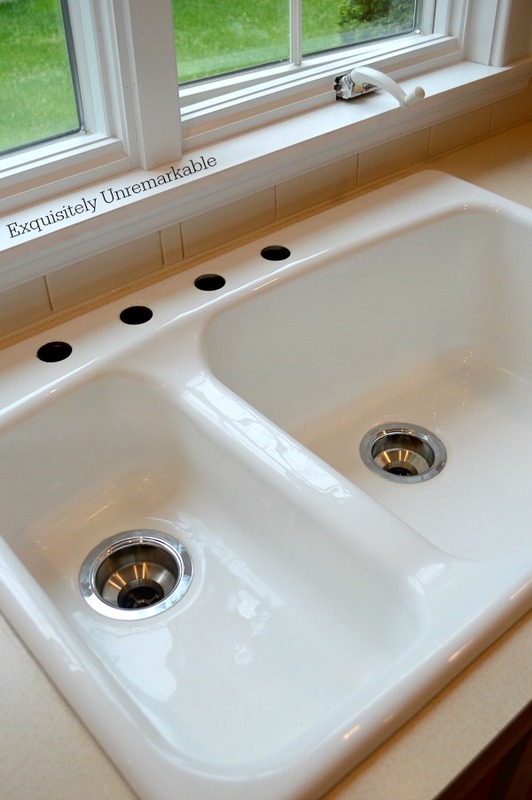 ;-) I absolutely love your clean, sparkling, white sink. You're right - it's perfect. 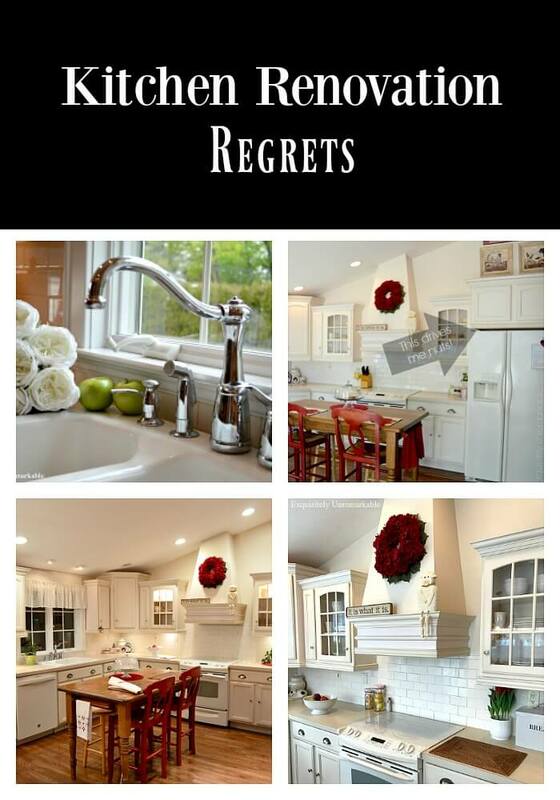 Now...I do need a new sink AND new countertops! But those are waay on the back burner with getting new central air, the roof fixed, and a new porch and sidewalk put in this summer. Priorities Melanie!! I hear you loud and clear. The a/c, roof, porch and sidewalk are necessary fixes...just not nearly as fun to tackle. Good luck with all your renovations. Oh my! I just found your blog and already I know this is a beautiful place to visit. You have inspired me in my old love to decorate. Thank you for that. You are a very beautiful lady and I can't believe your husband is for real. How blessed you are! I have a sink very similar to your's and I love it - I think you inspired me to give mine a good cleaning. Thank you, Ronda, you are too sweet. My husband is a good guy, you'll get no argument there, but it helps that he has the DIY bug, too!